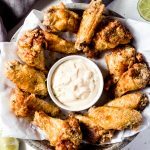 Probably one of the easiest chicken wing recipes I’ve shared – these Air Fryer Roasted Chili Chicken Wings are full on flavor, gluten-free, and are done in 30 minutes from start to finish. These wings have just the right amount of crispiness on the outside – with a simple coating of roasted chili olive oil, then served with a roasted chili aioli. Air fryers are probably one of my favorite kitchen gadgets to cook with, next to my Kitchenaid mixer. They’re so versatile – from frozen foods to fresh fish to quick and easy chicken wings; you can cook just about anything in an air fryer – just like these roasted chili chicken wings! This sponsored post is in partnership with Olive Tree. All thoughts and opinions expressed herein are my own and not influenced by the company and its affiliates in any way. Cooking chicken wings in an air fryer is probably my new favorite method for cooking chicken wings. Seriously – such a time saver! 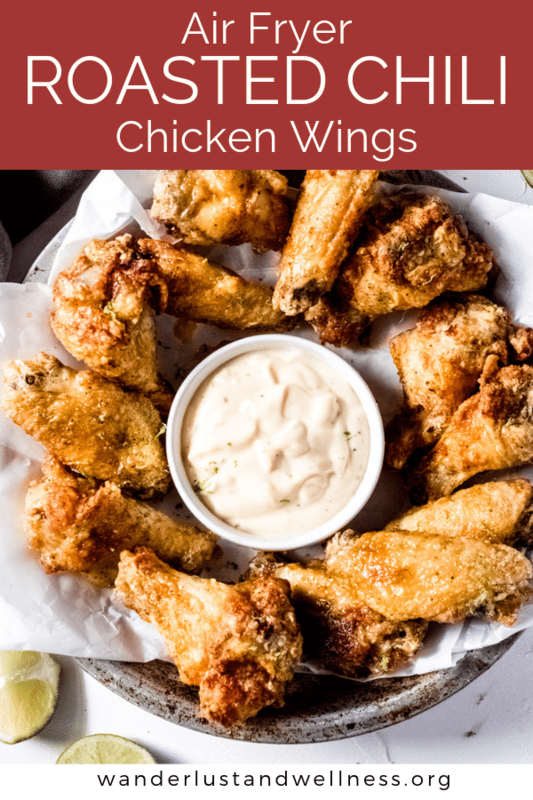 Depending on how big your air fryer is, you may have to cook your wings in small batches, but the simplicity of cooking wings in an air fryer is makes it hands-down the easiest cooking method for wings. 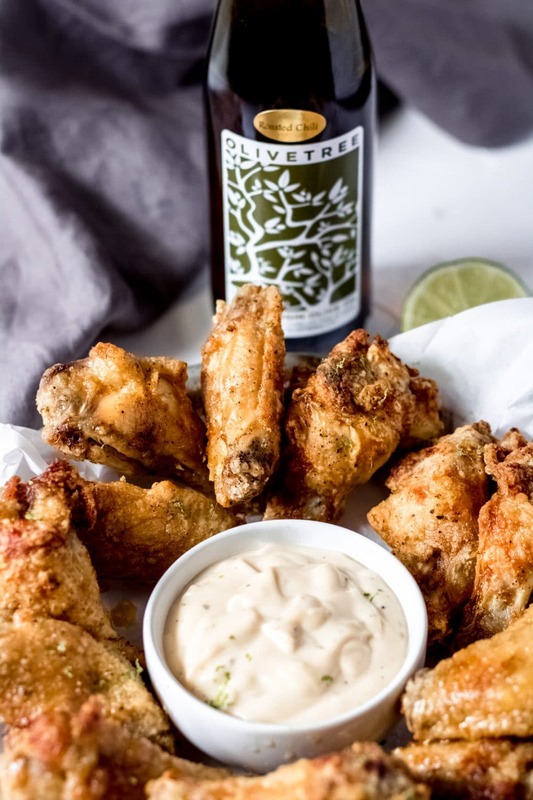 These wings are coated in a heavy sauce – instead, we coat them just enough to give them a crispy outside skin and then give them a brush of Olive Tree’s Roasted Chili Olive Oil. Then, we serve these wings with a roasted chili aioli dipping sauce, which makes these wings one of a kind! 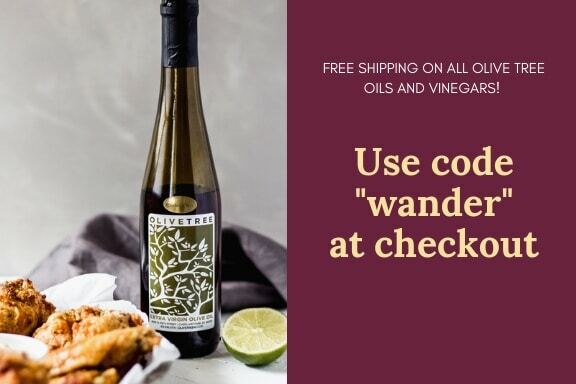 Plus – our friends at Olive Tree are offering FREE SHIPPING for the Wanderlust and Wellness community! Just use the code “wander” at checkout to receive free shipping on your order! 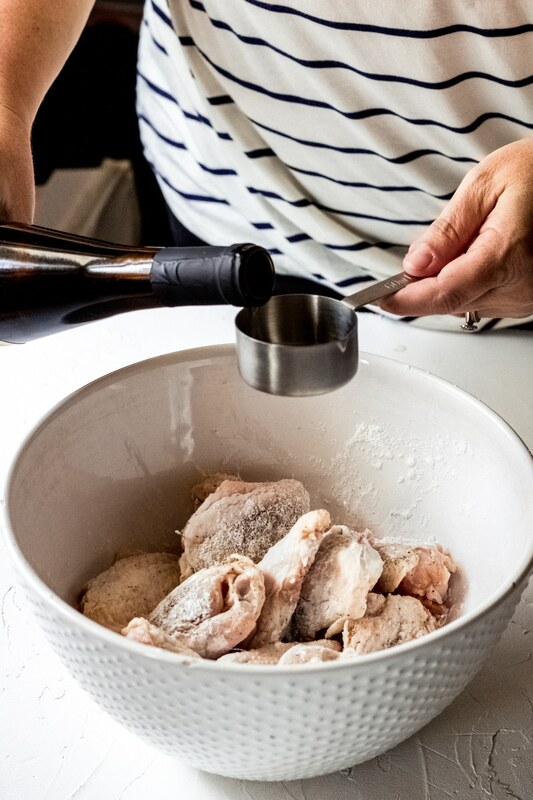 Place fresh – not frozen – chicken wings into a large bowl. Add salt, pepper, and arrowroot powder and toss to coat. Then, add 1/4 cup Olive Tree Roasted Chili Olive Oil, lime juice, and lime zest and again toss to coat. Place wings into the air fryer basket in a single layer, then cook at 400 degrees for 25 minutes. During the cook time, open the air fryer every 10 minutes to turn the wings. Depending on the size of your air fryer, you may have to cook the wings in multiple batches. While the wings are cooking, make the Roasted Chili Aioli. Add all ingredients to a bowl and whisk to combine. Refrigerate until ready to use. When the wings are done, remove from air fryer. Using a basting brush, brush on the additional 1 Tbsp. of Roasted Chili Olive Oil. Serve immediately with the roasted chili aioli dipping sauce. How many wings can you cook in an air fryer? 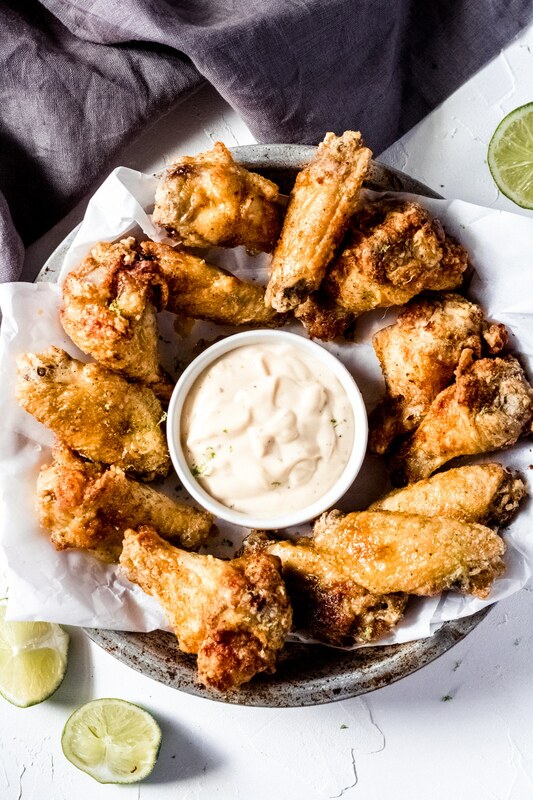 This depends on how big your air fryer basket is, but you’ll want to add enough wings to cover the entire bottom of the basket but you’ll only want a single layer of wings – do not stack them on top of one another. 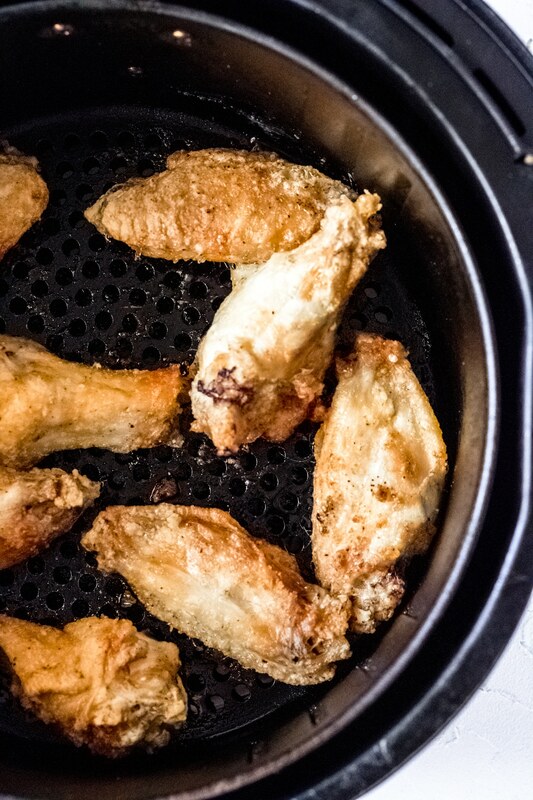 Can you stack wings in an air fryer? No, you do not want to stack wings in an air fryer. Only cook them in a single layer. Can I cook frozen chicken wings in an air fryer? The simple answer is yes. If you are cooking frozen wings you’ll want to increase the cook time to 30-35 minutes. However, I still recommend using fresh or thawed wings for the best tasting chicken wings. Are air fryers really healthier? Yes, compared to oil frying, air fryers can reduce the number of harmful compounds in your food – especially if low-quality cooking oil is used. However, I always urge you to review the nutritional information of each recipe and make a personal choice and recommend following an intuitive eating lifestyle. Enjoy these drinks with your chicken wings! Delicious air fryer roasted chili chicken wings are gluten-free and cook in under 30 minutes from start to finish. Place fresh, not frozen, chicken wings into a large bowl. Add salt, pepper, and arrowroot starch and toss to coat. Next, add 1/4 cup Olive Tree Roasted Chili Olive Oil, lime juice, and lime zest, and again toss to coat. Place wings into the air fryer basket in a single layer, then cook at 400 degrees for 25 minutes. 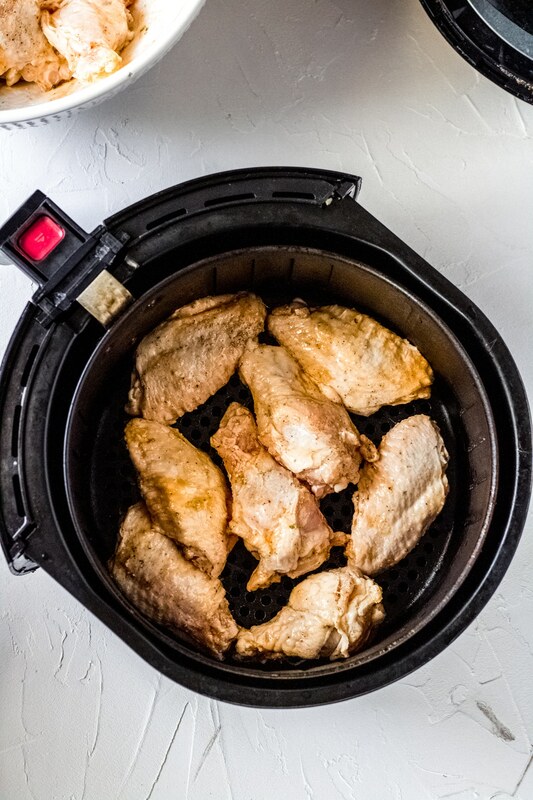 During the cook time, open the air fryer about every 10 minutes to turn the wings. Depending on the size of your air fryer, you may have to cook the wings in multiple batches. When finished cooking, carefully remove wings from the air fryer basket with kitchen tongs. Using a basting brush, brush the additional 1 Tbsp. of Roasted Chili Olive Oil over the chicken wings. 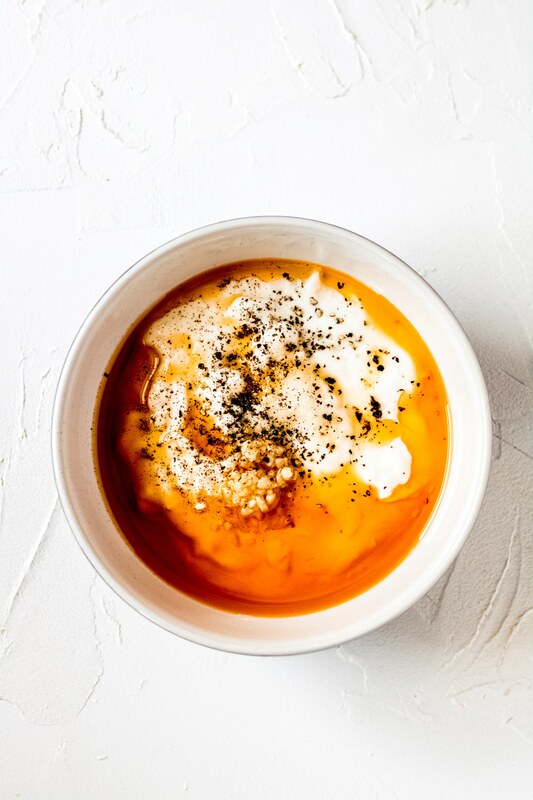 Serve immediately with the Roasted Chili Aioli. If you do not have arrowroot starch, you can replace with corn starch.